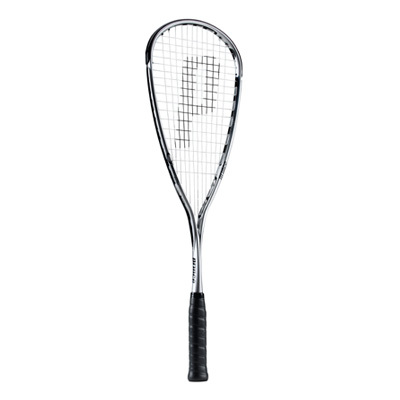 The Prince O3 Speedport Silver is ideal for players wanting more power and control in an extremely aerodynamic and lightweight frame, allowing the player precise shots from all areas of the Squash court. The Speedport racquets give you the largest sweetspot for perfect control, ultimate speed, more power & unmatched stability for pin point accuracy. A winning combination! * SPEED - Wind tunnel testing proves O3 Speedport racquets move through the air up to 24% faster than traditional racquets. So you can hit your best shots. More often. Even faster. * SWEET SPOT - Laboratory testing proves that Speedports strengthen and stabilize the frame for up to a 59% bigger sweet spot, creating a sweetzone. * GREATER STABILITY - O3 engineered racquets are created through a one step fusion process that utilizes the strongest structure known to man, the Arch, creating the frame’s O-Ports. These O-Ports stabilize the racquet giving you more control on off-center shots. Headsize: 485 sq.cm. / 75 sq.in.